Rating: 84 percent based on 759 votes. 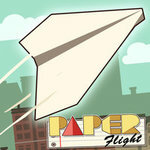 Description: Throw your paper airplane into the skies and see how far it can travel before it hits the ground. Collect points along the way which you can use to purchase upgrades for your plane.